Person, I don’t know what you’re talking about. I think you’re making something up. I don’t even smell anything interesting. That’s got to mean you’re making it up. There is nothing that’s about to crawl on me – or bite me, or anything else. Why do you make things like this up? You probably can’t think of anything to put in my blog post so you’re making things up instead. If you’d just take me on longer walks we’d have all kinds of adventures. I’d have to do extra posts to get all the adventures in. But no, you’ve got to make things up instead. Jackie, they might be big but they’re harmless. KILL IT WITH FIRE BONGO! A million tiny fires. 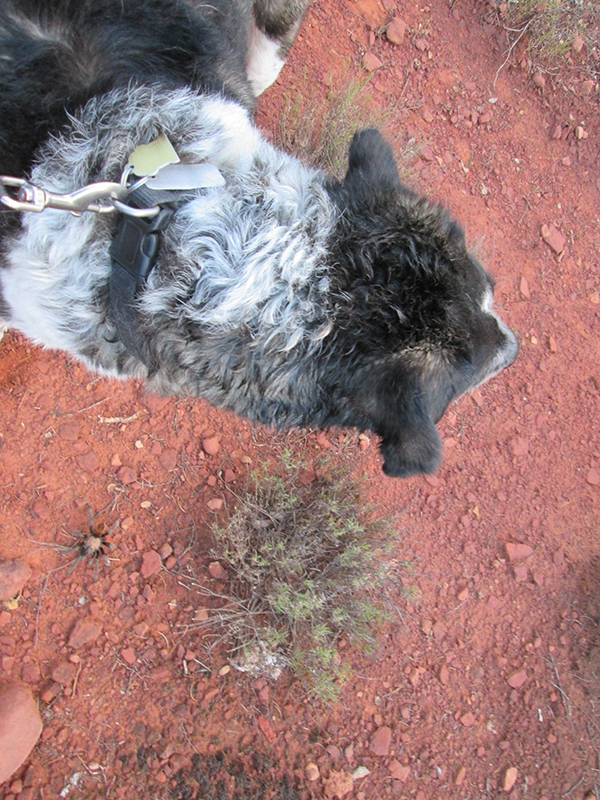 Kimberly, I’m thinking maybe the aliens that hang out on my trails will beam it up. Oh I hope they do that soon. I don’t like spiders. Fuzzy ones even more so. Nasty, hairy, evil looking spider…but his Mom loves him. If I were you Bongo I would stay away from him…he or she, could have a very bad bite…. yikes is right! Patrecia, my person says they might be big and scary looking but they’re harmless. That s what she tells you and me!!!!!! Lily & Edward, they’re really kind of boring. They don’t do much and they’re harmless. LeeAnna and Cole, I won’t bite it as long as it doesn’t bite me. Moving rock – probably mad as it seems to be covered with moss! Watch out Bongo – it may jump trying to toss that stuff off! Karen, a jumping, moving rock covered with moss. Now that is frightening. I think I’ll just settle for hanging out with this tarantula. Pigs, we have little spider, medium sized spiders, and big spiders here. That big spider is a tarantula. The tarantulas around here are harmless. We have big spiders here, too, but I think I would freak if I saw that thing on the ground near me! Eeeks! 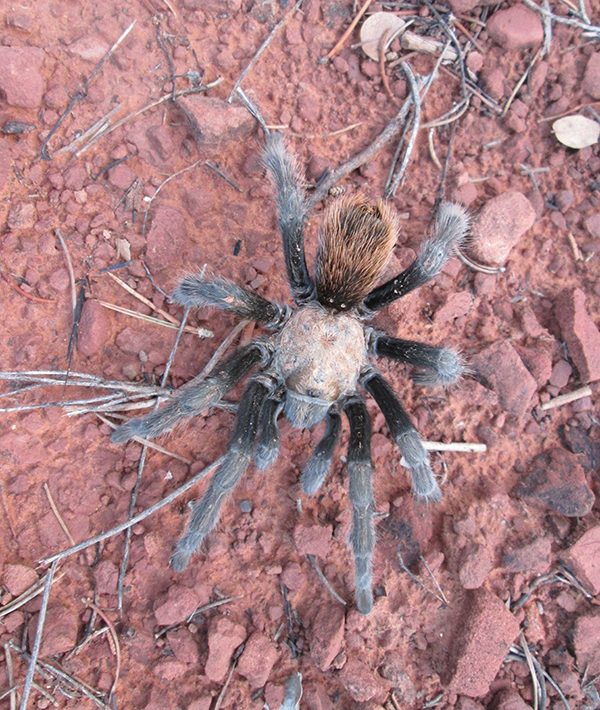 Rama’s Mama, the tarantulas come out every August around here. They move really slow and they’re harmless. Gah! OMGoodness, B. I’m not positive, but it think I may see something….HUGE! Go home, get into your dog jail and lock the door! Cupcake, that tarantula might be huge but I think it can still squeeze between the bars of my dog jail. I’m working on an alternate plan now. Awe, your dog is so cute!! That is a huge tarantula!! Thanks Lauren. Tarantulas like that usually show up every year around this time. Thanks for stopping by and commenting. Oh! is right. I would get outta there fast! Patricia, at least I can move faster than that tarantula. They just lumber along. If I saw a tarantula I would move faster than Superman! I don’t think I would have gotten that close, typist would have ran away screaming as soon as she saw it!! Dalton, that spider stopped moving – hoping we wouldn’t see it. P.S. Is that tarantula, isn’t it? Kevin, yes that’s a tarantula. I think it was more scared of us than we were of it. It stopping moving, hoping that we wouldn’t notice it. Ginger, I usually only see one at a time, but once my neighbor saw a whole bunch of them. That’s my friend Toby’s person. 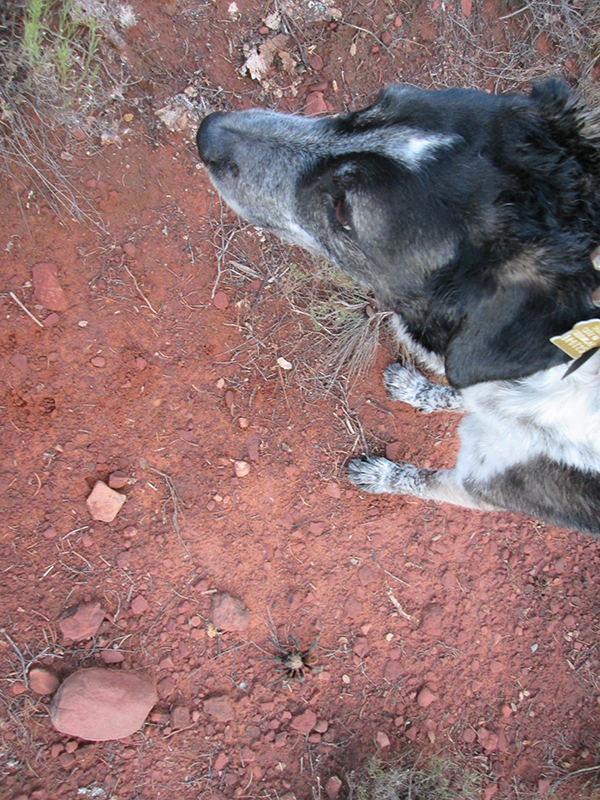 We might have to recruit Toby so his person will help us find the tarantula army. Epicaldragon, some people do have tarantulas as pets. The ones around here are harmless and very gentle. Chancy and Mumsy, at least it didn’t jump on me and go for a ride. Eeeeeeeek. I thought our wildlife was scary. You can keep that one. Flo, this spider might look scary but it’s harmless. We do have a few poisonous things around here, but at least I hardly ever see them. Marina, I think their bark is bigger than their bite. These spiders look scary but they’re really harmless. This one stopped moving, hoping we wouldn’t notice it. Yikes!! We are not a fan of even harmless spiders! 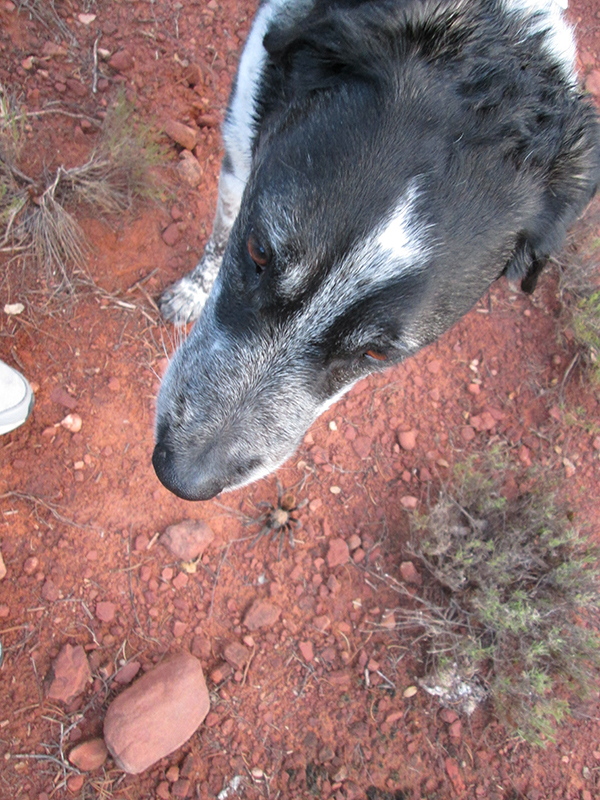 DZ Dogs, I think that tarantula was more scared of us than we were of it. Thanks for stopping by and commenting.